Mathias Frank (BMC Racing) took the overall race lead in today’s third Tour de Suisse stage, between Montreux and Meiringen, as the best-placed rider of the four-man group that arrived at the finish. Despite being in a team of big names, which includes World champion Philippe Gilbert and Tour de France hopeful Tejay van Garderen, the 26-year-old Swiss rider is the Swiss-sponsored American team’s protected rider for his home race. Starting the day in third place overall - just five seconds behind stage one time trial winner Cameron Meyer (Orica-GreenEdge) and two behind Ryder Hesjedal (Garmin-Sharp) - thanks to his second place on the mountaintop finish at Crans-Montana on stage two, Frank knew what he needed to do to take the lead on the 1st category Hasliberg climb inside the final 30km. “The whole team did a great job, placing us at the bottom, and Tejay set the perfect pace,” Frank explained. “After the crash of Ryder Hesjedal there, I knew okay if I we get rid of Meyer I’m going to have the jersey tonight. Hesjedal was forced to abandon after his crash, but it could have all gone horribly wrong for Frank also, as he himself was brought down midway through the stage. Now in his fifth year in the professional ranks Frank’s best results by far have come in his home Tour. 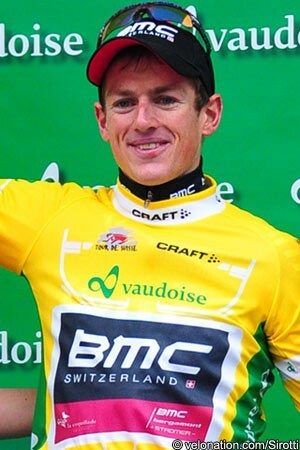 In 2010 he won both the mountains and sprints jerseys, in 2011 he finished sixth overall, while in 2012 he picked up the best Swiss rider classification. He now leads the race for the very first time, and - while he knows that the remaining six stages of the race will be eventful - he feels that the BMC Racing Team is strong enough to guide him to overall victory. “Generally, you should never underestimate any stages in the Tour of Switzerland, that’s what I learned in the last few years when I’ve done this race,” he explained. “Every day anything can happen, as you saw today with my crash, one moment of not being attentive can be fatal for you.